We've come to expect unusual things from LG. After all this is the company that put buttons on the back of phones and even made some of its handsets self-healing. 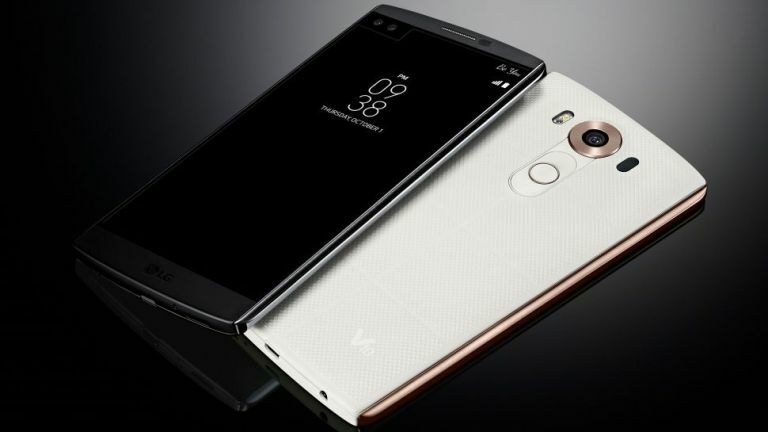 But the newly announced LG V10 might just be one of its oddest phones yet. Because with the V10, LG decided one screen wasn't enough and stuck a second one above it. This second screen is a 2.1-inch 160 x 1040 display that comes in at 513 pixels per inch and can stay on and show you the weather, time, date and battery life when the main screen is off. Turn the main screen on and it will switch to showing shortcuts to your favourite apps. Then if you get a message or call while playing a game or watching a video the second screen will alert you to it so as not to interrupt what you're doing. It's a sound idea, but when that main screen is already a 5.7-inch 1440 x 2560 display (for the same pixel density of 513ppi) you're looking at one big phone. The innovation doesn't end with two screens. The LG V10 also has 5MP dual front-facing cameras, with two separate lenses allowing you to capture wide-angle shots of up to 180 degrees by stitching two images together. Then there's its build, which consists of a stainless steel frame and intriguing 'Dura Skin' back, which is designed to be highly resistant to nicks and scratches. If nothing else it's got to be better than the leather-backed LG G4, right? The core specs and features aren't too shabby either. It borrows a lot from the LG G4, with the same Snapdragon 808 processor, 3,000mAh battery and 16MP main camera, but it's been boosted up to 4GB of RAM. Rounding out the specs there's 64GB of storage, a microSD card slot, Android 5.1.1 on board and a fingerprint scanner. The LG V10 is set to start rolling out across the world in the weeks to come, though there's no specific UK information and no price has been attached to the phone, but you can bet it will be expensive.